Those are actually pretty handy for “normal” closets. 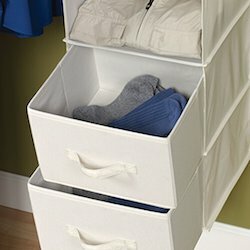 I use a small dresser for PJs, undergarments, socks, etc., and the larger hanging shelves for my other clothes that don’t get hung up. Just make sure you get ones with larger spaces and stiff bottoms. The hanging shoe storage shelves work well, too — I prefer them to the behind the door pocket things. You can get these from Ikea too for a bit cheaper. I have a really wide deep closet that takes up one whole wall in my apartment bedroom. I got 3 of these hanging things instead of a dressor so I could make better use of the actual space in the bedroom. I have one of these in my closet, but I’ve never been that impressed by it actually. What I find works a bit better because it’s sturdier are those shelves that are about the same time that can be purchased at Lowe’s hardware for about $15 if i recall. It’s a little more but 2 of them will stack up and it’s still way more affordable than a nice dresser. Having an actual *firm* plywood square instead of a fabric one also stores hats and other not quite stackable items a LOT better.